COSHH – Crystalline silica dust. COSHH – Tile adhesive and grout. Method Statement for brick and block work. Method Statement for Block and Beam floors. Method Statement for concrete foundations. Method Statement for Drainage Work. Method Statement for lifting operations. Method Statement for Control of Construction Dust. Method Statement for painting and decoration. Method Statement for Taping Jointing and Plastering. Method Statement for site establishment. Method statement for the Installation of electrical services. Method Statement for the erection of timber framed houses. Risk Assessment -Buried and overhead services. Risk Assessment Disposal of Waste Materials. 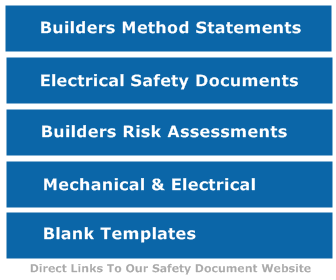 Risk Assessment for brick and block work. Risk Assessment for cutting and grinding. Risk Assessment For excavators and excavations. Risk Assessment for Electrical Work. Risk Assessment for Manual Handling. Method Statement for wall and floor tiling. Risk Assessment For Slips and trips. Risk Assessment for work at height. Risk Assessment- Hand Arm Vibration.